Something you should know: So, most of you know that I keep what most consider non-traditional hours, right? And most of you know I have a knack for getting weird aches and pains (usually at non-convenient hours). That’s why I was excited when Collective Bias offered me the opportunity to try out Walgreens’ pharmacy chat service as part of a compensated shoppertunity. While I was compensated for this post, the opinions and experiences I share are entirely my own thoughts. 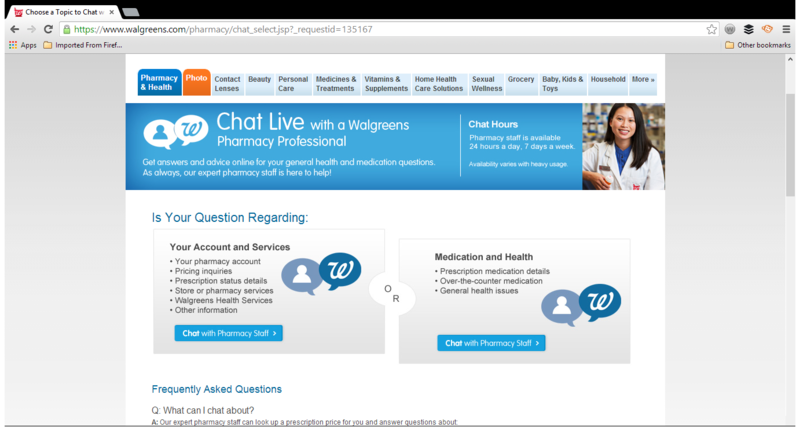 As in yes, it’s what I actually think about using Walgreens pharmacy chat. A couple of weeks ago, I had kind of a bummer week. First of all, I was going through what I thought was the stomach bug and then I fell out of my wheelchair twice in about 20 minutes, giving me tons of muscle aches and pains. Really, just not a good time. Just about anyone who knows me knows I keep what most consider weird hours. My husband works second shift and doesn’t get home for dinner until after 11 p.m. With me being self-employed and working from home, I’m blessed to be able to adapt my lifestyle and hours around his schedule. That flexibility also is convenient because it allows me to make choices and take care of various situations from errands to doctor visits without interfering with a traditional job schedule. The downside? When I need to communicate with people who are on a traditional schedule like, say, doctors or a pharmacist. Wondering ideas for managing the stomach bug that I got a couple weeks ago is not really convenient at 8 p.m. when pretty much the only medical professional available is the emergency room. I’m a firm believer that the ER is only for like….emergencies so I was not about to call and ask for basic advice and reassurance. That’s where the awesome Walgreens pharmacy chat came in. I already had a doctor’s appointment scheduled but I wanted to talk to someone in the medical profession at a time that worked best for my brain and also wanted someone else’s input. I’ve found that pharmacists are a wealth of information and can talk about (in generalities) what symptoms a lot of people are having in the area and what is taking care of them. The Walgreens pharmacy chat is easy to find once you log into your Walgreens account (which is free). I had a very short wait time and was able to go into some gross detail about my stomach bug because I wasn’t actually looking at the person. I’m weird about feeling embarrassed about stuff like that. I can do it, but preferred the anonymous version of the pharmacy chat! I scribbled out the gross details of my stomach bug (you’re welcome) but wanted to show you the chat window. It’s pretty easy and you can email it to yourself in case you want to save it for future reference. You can also print it. 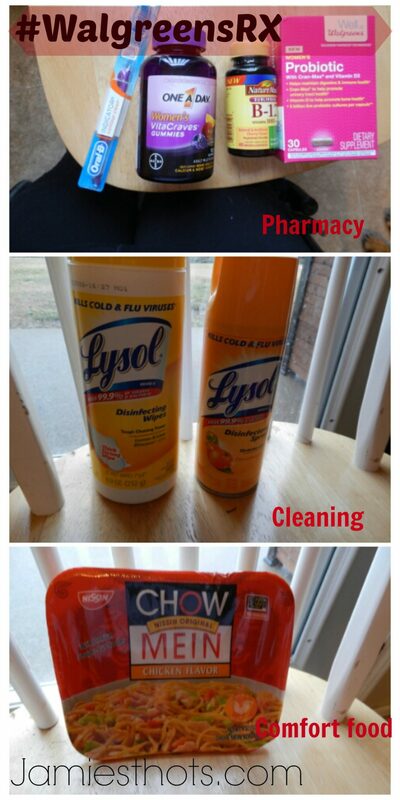 The next day I headed out to Walgreens to pick up a few items that were suggested. As you can see from the chat, you pretty much just have to wait out the stomach virus. I did get probiotics to help replace the good bacteria in my gut and got some supplements to keep my waning energy up and help with immunity. I know the pharmacist said replacing my toothbrush wasn’t necessary, but I was paranoid and did it anyways. I also got some supplies to help replace cleaning items I had already used. And what is having the crud without some blandish comfort food? Most go for chicken noodle soup but I like lots of noodles so you can see from my first picture that I got microwaveable chow mein. It was nice to find all the items I needed in a store that is big enough to have what I needed but not so big that I felt overwhelmed when I was already not feeling that great. By having a list from the pharmacy chat, I was able to go in and get what I needed without asking for help in the store. When you’re not feeling that great, human interaction isn’t that fun, you know? 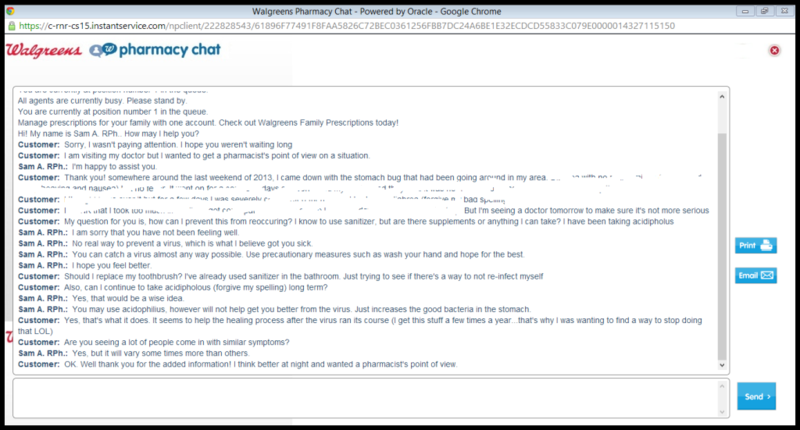 OK so I used the Walgreens pharmacy chat for the stomach bug and thought “oh good, I was able to use the good feature for my shop.” Then last weekend I was walking my dogs and well, they were a little excited and I was not very coordinated. I managed to fall out of my wheelchair twice in one block. Yes, I’m serious. I’m kind of a big girl and you know the saying about “the bigger they are the harder they fall?” Yeah, I fall hard. It hurts. I don’t break anything but it’s a recipe for soreness! I can’t take NSAIDS including aspirin or Ibruprofen, which most people take in these instances. I didn’t want to overload on Tylenol because really it was just muscle soreness. I asked on Facebook for advice but realized that an actual medical professional might be a good idea. So where am I supposed to get that on a Saturday or Sunday night? Woo hooo! 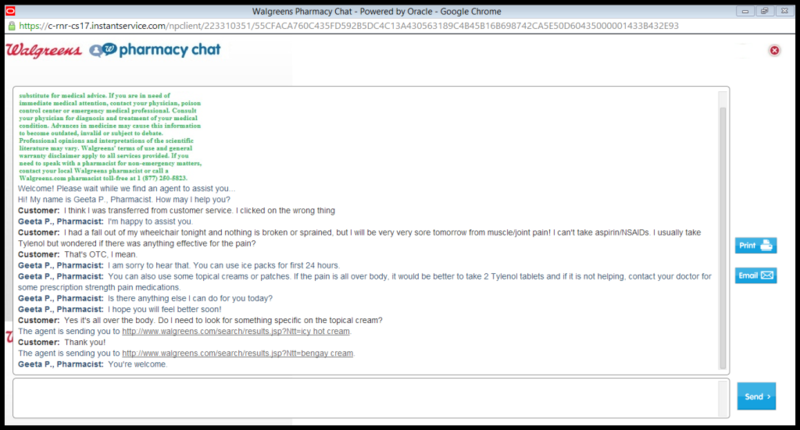 Walgreens pharmacy chat to the rescue again. 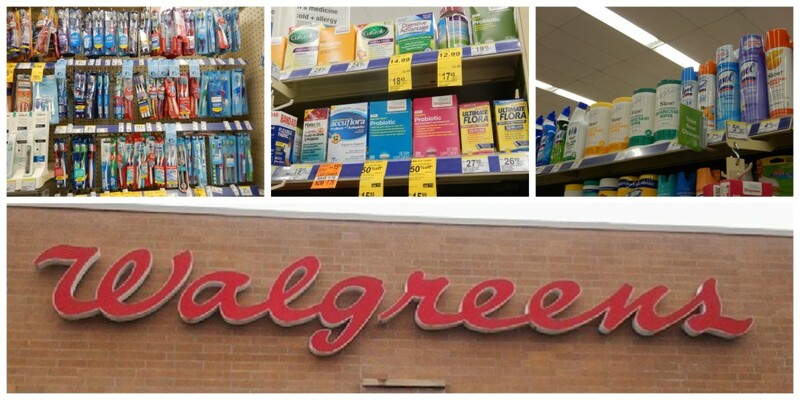 They were able to make recommendations for topical muscle relaxers and even sent me a link to some products at Walgreens so I knew what to look for. That was so much more of what I needed than just killing the pain with painkillers. I was instead able to help heal what was hurting. By the way, in case you’re wondering, Icy Hot comes in spray now. I had no idea. Awesome stuff. When I don’t feel well or I’m hurting, I have to admit that it interferes with my life. I wish I was some kind of superwoman who could work like normal, manage the house like normal and play with my kids (fur-covered or otherwise) like normal. But I just can’t. Now that I’m feeling better and haven’t had to spend a lot of my day-time hours at the doctor’s office for mundane stuff, I’m able to get back to my life again. Oh, including my blog. That is a great thing! 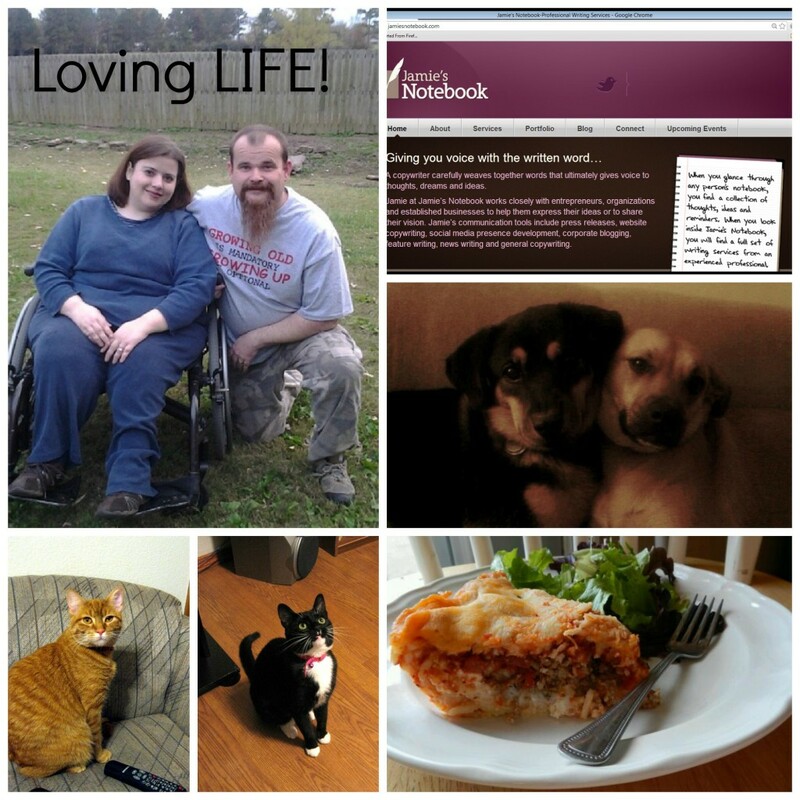 Time with husband, my job, my fur kids and cooking feels like a luxury after not being able to manage all of it when I am sick. Great information! It always seems like I first get sick in the middle of the night and then just lay there in pain until the morning when doctors’ offices open. The pharmacy chat sounds like a wonderful way to get medical advice at odd hours. Thanks for sharing! Thanks for coming by Kelly and Deborah! Yes, I really liked this feature and was surprised I had not heard about it. I’ve been a Rewards member for a while now and never noticed it. This is really interesting; the weekends seem to be the time sickness likes to hit, and like you I want to steer clear of the emergency room. Going to check this out. I’m so sorry you’ve had such a rough time and been so sick. Thanks! I hope you find it as useful as I did.